THE HOG wants to send you on the concert destination of a lifetime! 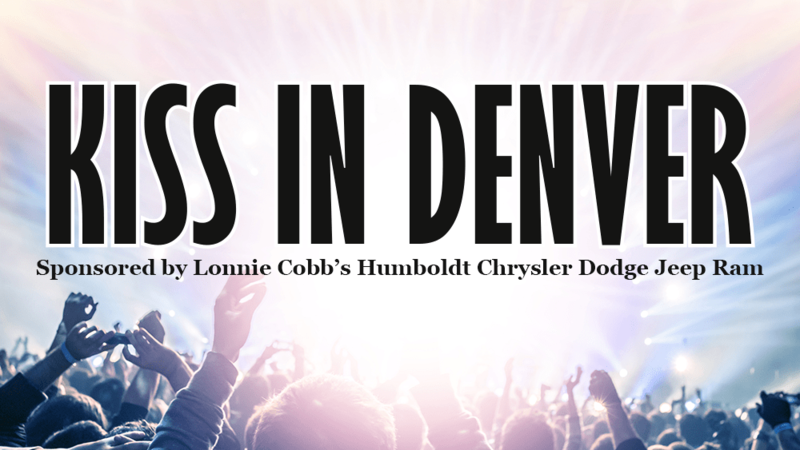 We’re giving away 2 TICKETS see KISS at the Pepsi Center in Denver, CO on September 12th! You’ll also get round trip airfare for 2 and a hotel stay! Beginning April 1, 2019 through May 3rd, 2019, listen each weekday for the cue to call. When it airs, the 9th person to call 731-427-9968 will be named a qualifier. You’ll be qualified for our Grand Prize Giveaway to take place on Saturday, May 4th at Lonnie Cobb’s Humboldt Chrysler Dodge Jeep RAM at 3301 East End Dr. in Humboldt. QUALIFIERS can only qualify once per household, must be 21, & and must be present to win at the reverse drawing Saturday, May 4th at Lonnie Cobb’s Humboldt Chrysler Dodge Jeep RAM at 3301 East End Dr. May begin check-in process at 11am, must be in line to be checked in by NOON, and no stand-ins allowed. Be sure to bring I.D.